Why are we The Greyfriar? We don’t believe food should be fussy. But it must be good and served with a smile! And we are a pub that sells great food and provides a great service. Our bar menu is inspired in part by Norma’s love of Tapas. Food made for sharing. Each dish is made from fresh ingredients and is packed with flavour. For something more substantial why not try The Greyfriar burger or a bowl of cheesy triple cooked chips with truffle oil? Our restaurant menu features some perfectly prepared classic pub grub in addition to some innovative plates which draw on Simon’s top level restaurant experience. Sunday lunch at The Greyfriar – Put off by overcooked pub Sunday roasts, with tired veg, soggy roasties all swimming in insipid gravy? So are we. At the Greyfriar we aim to serve a Sunday roast you would be proud to serve to your friends and family at home. All our meat and veg is locally sourced and the joints are carved to order. Our roast potatoes are crisp straight out of the oven and the vegetables cooked to perfection. Our delicious homemade gravy can be served on the side. Dan’s passion for food began in his teens. While at school in his native Wales, Dan worked as a kitchen porter at weekends and during school holidays to gain experience. Dan has trained under numerous chefs. Taking the best from each experience, this allowed him to hone his skills and his palate, developing his own unique style. Dan is passionate about ingredients and flavours. He says the key to creating superb flavours is to develop great relationships with the top local suppliers. This means they will go the extra mile, sourcing only the best quality ingredients, that will go on to define what Dan creates on the plate. Describing himself as experimental, he believes in developing his own recipes, by using traditional quality ingredients in different and innovative ways. 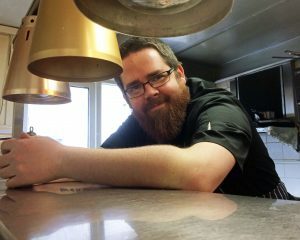 Dan’s aim is to win two AA Rosettes for the Greyfriar within the next 18 months. We look forward to working with this exciting and talented young chef over the coming months and years, supporting him on this exciting journey. To complement our superb flavour packed a la carte menu, during 2018 your hosts Simon and Norma will draw on many years working at the top of the hospitality industry and their love of international cuisine. Simon has lined up a series of guest chefs who will bring a taste of fine dining to Chawton. You can read more about our guest chef evenings and book your table here. In 1578, Nicholas Knight purchased the Chawton estate. There had been a manor house in the village since the 13th Century, but in 1588 around the time of the Spanish Armada, Knight decided to build a grand house in its place. Chawton House became known as the Great House 220 years later, thanks to Jane Austen’s association with the family through her brother Edward Austen Knight, who married into it and lived in Chawton House.